For the second consecutive season, Axtell and Argonia-Attica will battle for a spot in the 8-Man Division II state championship game. Last season, Argonia-Attica topped the Eagles 70-44 to advance to the title game, where the Titans fell 52-8 to Victoria. While the Titans are not necessarily putting up the gaudy offensive numbers from a season ago, they may be a more complete team. Argonia-Attica hasn’t played a full four quarters in any game this season. The Titans average 60.2 points per game this season, while giving up only 6.7 points per contest. Compare that to last year when Argonia-Attica scored 58.4 points and gave up 28 per game. On offense, the Titans average 285 yards of total offense per game compared to 385 per contest last season. Returning all-state quarterback Alec McDaniel has been able to spread the offensive production around to more teammates this season. McDaniel has rushed for 755 yards and 25 touchdowns, while passing for 565 more yards and nine scores. Devon Newberry leads the Titans with 917 rushing yards and has scored 27 total touchdowns. The improved defense is led by McDaniel’s 104 tackles, while Norwich-transfer Jacob Norris is second with 70 stops. McDaniel and Kolten Koerner lead the Titans with four sacks each, while Newberry and Norris each have two interceptions. In all, the Titans have scored five defensive touchdowns and have four scores on special teams. Axtell has won ten consecutive games since a 48-22 loss to Division I’s No. 2 Hanover to open the season. Colton Buessing, who joined McDaniel in receiving Kpreps all-state honors in 2014, missed three games this season due to injury. Despite his limited time, Buessing has passed for 1,229 yards and 18 touchdowns while completing 64 percent of his passes. Buessing is also the team’s leading rusher with 563 yards and 12 touchdowns. Sophomore Kaleb Buessing is second with 502 rushing yards and has scored 16 touchdowns on the ground. It was Kaleb Buessing who stepped in at quarterback in Colton’s absence and passed for 456 yards and four scores. Seniors Brice Koch and Adam Kuckelman led the Eagles in receiving with 588 and 464 yards, respectively. Koch has nine touchdown catches, while Kuckelman has four more. Kaleb Buessing has 287 receiving yards and five scores. Koch leads the Axtell defense with 86 stops, while Kaleb Buessing has 84 tackles. In last year’s meeting, McDaniel rushed for 181 and five touchdowns to lead the Titans to the win. Argonia-Attica led 34-22 at halftime and used a big third quarter to take a 56-30 lead heading into the fourth quarter. Buessing passed for 257 yards and four scores in the game for Axtell. This marks the second contest since Wallace County senior standout Luke Schemm collapsed in last Tuesday’s first-round playoff contest against Otis-Bison. Schemm passed away Wednesday after he was life-flighted to Denver. Wallace County won at Ingalls, 74-58, in an emotional game on Saturday. The two traditional powers played in the 2014 sub-state championship game, won 28-12 by the Knights in Victoria. Victoria went on to win the state title and is currently on a 22-game winning streak. The Knights are in the playoffs for the 14th straight season, the longest current run in eight-man football. Wallace County has made the playoffs every year since 2006 and is in the sub-state game for the fourth consecutive season. The Wildcats are 1-2 in those games and last won a state title in 2007. Coach Jeff Hennick, the quarterback on the ’07 team, is 22-1 in his second year as head coach. Both teams are very experienced and senior-laden. For Victoria, the strength comes with its outstanding front line led by seniors Eric McAlonan, Brandon Brungardt, Wheaton Hockersmith and Lane Kisner. The Knights have squelched running games all season and the last three games of the ’14 playoffs. This year, teams have averaged 61 rushing yards and 2.55 yards a carry. 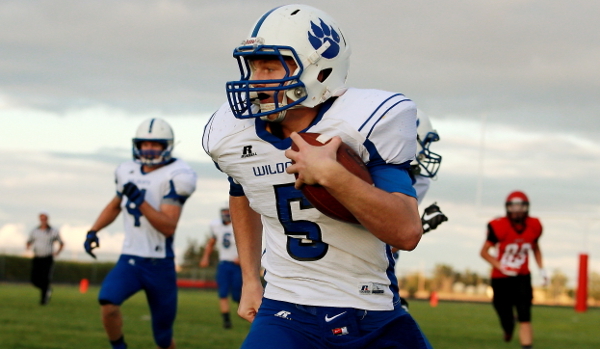 Senior all-state safety Brady Dinkel has added another element since his return in Week 9. Dinkel had missed seven games due to significant health concerns. In three contests, Dinkel is 3 of 3 passing, all for scores. In addition, he has nine offensive touches for 135 yards and two touchdowns, both receiving. Dinkel picked off a key pass in a Week 9 win against Otis-Bison and a forced and recovered fumble on the same play versus Minneola on Saturday. Victoria has enjoyed great special teams as well, including two kick return touchdowns from Collin Kisner in the last three contests. The Knights have an average margin of 492-78 and rank No. 3 in scoring defense. Wallace County has a scoring margin of 574-150. The Wildcats have become significantly more explosive with senior quarterback Eric Gfeller, in his second year as the starting quarterback. Last year, Gfeller had 932 passing yards, 574 rushing yards and 33 scores. This season, he has accounted for 48 touchdowns. Gfeller has passed for 1,230 yards with an additional 1,163 yards rushing. His receiving corps has vastly improved with seniors Spencer Medina and Cade Allen and junior Grady Hammer. Allen and Hammer – a former interior lineman in ’14 – had no catches last year. They have combined for 39 catches and nine scores. Medina has emerged as one of the standout eight-man receivers with 36 catches for 721 yards and 13 scores. Last season, he had 10 catches for 199 yards and five touchdowns. Wallace County hasn’t lost at home since Week 4 of the 2010 season. This game could be very similar to 2014, which Victoria led 8-6 midway through the third quarter. Prep Power Index lists Victoria as a 1-point favorite. Wallace County has Schemm to play for and the home field advantage, while the Knights have a great defense and experience. In the end, Victoria’s defense makes enough plays and wins.